A terriic new interface and an even better sound make Stereoizer 3 perfect for enhancing mono or stereo sound sources. Two enhancement processes. Great interface. Useful analysis display. Dynamic modulation for creative effects. Helpful auto-gain feature. Output balance and metering. 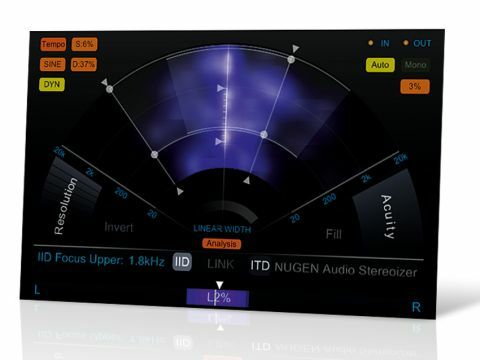 A glance at Stereoizer 3 reveals that NuGen Audio has been very busy. The company has basically rewritten the entire plug-in, taking its stereoisin' game to the next level. The aim is the same, however: to make mono sounds stereo, or stereo sounds, er, stereo-er. Stereoizer 3's interface relates closely to the audio. An arc-shaped display represents both the stereo width and frequency ranges of the plug-in's two main processes. Shining through this is an analyser that indicates frequency content and deviation from the stereo centre. Stereoizer 3 employs two width-inducing algorithms, IID and ITD, and this is the most significant change. The first, inter-aural intensity difference, concerns relative level differences between left and right channels - when a sound is louder in one channel than the other, it seems to come more from that direction. So in simple terms, IID creates a stereo effect by applying frequency-dependent panning. By contrast, inter-aural time difference (ITD) adds stereo width by creating left/right timing differences. On the arc display, the IID width is set by moving a 'radius' line from centre to left, and there's a line that moves the other way for ITD width. Moreover, both effects have shiftable upper and lower frequency boundaries. "Stereoizer 3 employs two width-inducing algorithms, IID and ITD, and this is the most significant change in this version." Beyond this, Stereoizer 3 retains the standard linear width adjustment of previous versions. There's also overall left/right output balance (with L/R solo), stereo image meter, automatic gain control, phase shift and a mono button for checking mono compatibility. Stereoizer 3 has some funky additional features to play with. You can modulate the IID and ITD e­ffects with a choice of LFO shapes and free or tempo-synced timing. There are also some extra functions for IID (Resolution, Focus and Invert) and ITD (Acuity and Fill), plus you can link IID and ITD, so their settings change in a relative way. From a sonic perspective, IID's Focus option has quite an impact. We found it enabled much steeper boundary frequencies and so resulted in a far tighter, more targeted e­ffect. Also signi­ficant is Resolution (also an option found on v2), as this a­ffects the density of the ef­fect. High settings give smoother and more usable results. Most signif­icant for ITD is the Acuity setting - we found it could a­ffect where transients appear in the stereo field, and setting it required some trial and error. While it may sound a bit scientific, Stereoizer 3 is easy to get to grips with and the option to bypass IID and ITD means you'll soon grasp their 'sound'. We found that IID produced a subtler, more rounded effect, whereas ITD is wider. We tried Stereoizer 3 on a range of mono and stereo sources, including synth bass, drum loops, live drums, piano, acoustic guitar, synth pads and vocals. The results were great, and definitely better than with v2. Also, the analysis display offers useful feedback on the dynamic nature of the effected stereo signal. The option to restrict the range of affected frequencies is very powerful, enabling tricks such as widening only the treble content of signal. And for more aggressive band-pass-style processing, there's IID's Focus option. 1. Mono synth bass. Taking a simple sound, first using the IID option to gradually add width. Bypass to compare. Increasing the lower frequency limit, then lowering the higher limit. Using the focus controls to highlight a small area. Bypass to compare. Next using the ITD option to gradually increase width, bypass to compare. Increasing the lower frequency limit, then lowering the higher limit. Bypass to compare. 2: Acoustic guitar. Using the IID option to add rich width, removing very low frequencies. Moving the incremental resolution fader to demonstrate difference. Adding the ITD option to make things wider still. Moving the incremental acuity fader to demonstrate effect. Bypass to compare.